A specific task or step during the production of parts in a manufacturing process. Many processes, such as machining, sheet metal fabrication, or assembly require a carefully planned sequence of operations. The total time required to complete an operation. In machining, this includes both the cut time and idle time. The order quantity or yield quantity is the number of parts required from a manufacturing process to fill a buyer’s total or annual order or to be used in a subsequent process. Due to the defect rates that are inherent to many manufacturing processes, a larger production quantity or run quantity must be manufactured to yield the desired order quantity. A chamber which is attached to the mold cavity that fills with molten metal during injection. The first material to enter the mold is allowed to pass completely through and enter the overflow wells. This strategy prevents early solidification of the molten metal and provides a source of material to compensate for shrinkage. When the part cools, the molten material will shrink and additional material is needed. 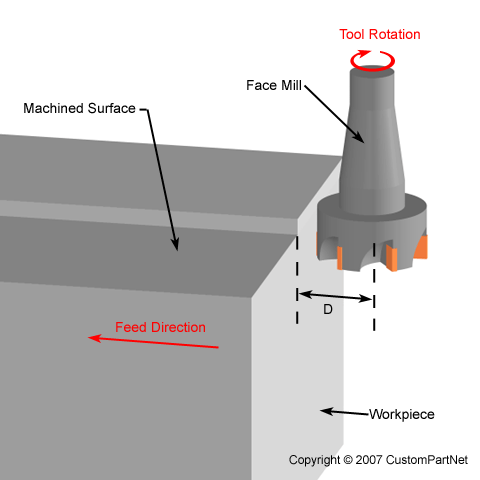 When machining a feature that is open on one or more sides, the tool may be allowed to move beyond the edge of the workpiece. This over-run distance (D) is measured from the edge of the workpiece to the center of the tool. Therefore, an over-run distance of zero will still allow the full feature to be machined.